Chris Weidman dethroned the legendary Anderson Silva in a shock knockout that crowns him the new UFC Middleweight Champion. Frankie Edgar prevailed via Unanimous decision in a Featherweight War with Charles Oliveira, one of two Featherweight fights that received Fight of the Night bonuses. Frankie Edgar won in his first non-title match after 7 bouts, and this three-round fight made him have to work much quicker. A good performance by Charles Oliveira definitely opens the prospects for his UFC future, meanwhile Edgar bounces back from two close split decision losses for the win. Great, great fight. 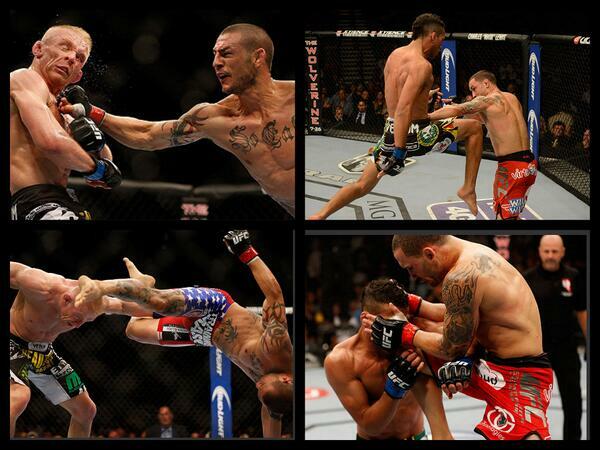 Cub Swanson and Dennis Siver opened the main card with a fantastic fight, and Swanson knocked out Siver in the third round and this win has Swanson in the title picture. In the main event, the Middleweight Championship was on the line, as Anderson Silva returned to defend against the undefeated Chris Weidman. Anderson Silva was extremely confident during the bout, taunting Weidman to hit him, by dropping his guard and backing up against the cage. At the end of the first round, Anderson Silva patted Weidman on the back before encouraging him to fight harder in the second round. The Lightweight Champion was clowning around as he engaged in a stand up war with Weidman, numerous kicks and punches exchanged. 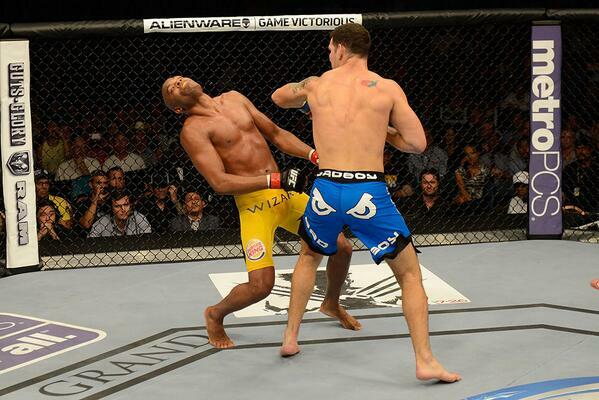 When Weidman hit a combination, Anderson Silva messed around acting like he was hurt, with his legs wobbling. Then, Chris Weidman made him pay. Weidman landed a left hook on Silva that knocked him down, Silva's eyes rolled back as Weidman finished it, and referee Herb Dean called a stop to the fight. It was the end of an era, as Silva's seven years and sixteen fights of being undefeated in the UFC came to a sudden and shocking end. No doubt it is a shame that it ended in the way it did, with Silva clowning around that cost him. When Silva was asked about a rematch, he said he did not want one, and had nothing but respect for Chris Weidman. "My legacy for the belt is finished tonight," Silva said. Silva is not retiring there, though. He still is the Greatest UFC fighter to ever live, and he wants to fight again, but not for the title. Hard work has made him a legend, but where does he go next? Ever thought you'd see the day? Anderson Silva has been dethroned, knocked out in a shocking moment. Chris Weidman is the new UFC Lightweight Champion, he has defeated the Greatest of All Time. Let the Weidman era begin. MGM Grand Garden Arena, Las Vegas, Nevada.